In the past two decades, philanthropy in the Netherlands has gained significant attention, from the general public, from policy makers, as well as from academics. Research on philanthropy in the Netherlands has documented a substantial increase in amounts donated to charitable causes since data on giving in the Netherlands have become available in the mid-1990s (Bekkers, Gouwenberg & Schuyt, 2017). What has remained unclear, however, is how philanthropy has developed in relation to the growth of the economy at large and the growth of consumer expenditure. For the first time, we bring together all the data on philanthropy available from eleven editions of the Giving in the Netherlands survey among households (n = 16,344), to answer the research question: how can trends in generosity in the Netherlands in the past 20 years be explained? One of the strengths of the GINPS is the availability of data on prosocial values and attitudes towards charitable causes. In 2002, the Giving in the Netherlands survey among households was transformed from a cross-sectional to a longitudinal design (Bekkers, Boonstoppel & De Wit, 2017). The GIN Panel Survey has been used primarily to answer questions on the development of these values and attitudes in relation to changes in volunteering activities (Bekkers, 2012; Van Ingen & Bekkers, 2015; Bowman & Bekkers, 2009). Here we use the GINPS in a different way. First we describe trends in generosity, i.e. amounts donated as a proportion of income. Then we seek to explain these trends, focusing on prosocial values and attitudes towards charitable causes. How generous are the Dutch? Vis-à-vis the rich history of charity and philanthropy in the Netherlands (Van Leeuwen, 2012), the current state of giving is rather poor. On average, charitable donations per household in 2015 amounted to €180 per year or 0,4% of household income. The median gift is €50 (De Wit & Bekkers, 2017). In the past fifteen years, the trend in generosity is downward: the proportion of income has declined slowly but steadily since 1999 (Bekkers, De Wit & Wiepking, 2017). In 2015, giving as a proportion of income has declined by one-fifth of its peak in 1999 (see Figure 1). Why has generosity of households in the Netherlands declined? The first explanation is declining religiosity. Because giving is encouraged by religious communities, the decline of church affiliation and practice has reduced charitable giving, as in the US (Wilhelm, Rooney & Tempel, 2007). The disappearance of religiosity from Dutch society has reduced charitable giving because the non-religious have become more numerous. The decline in religiosity explains about 40% of the decline in generosity we observe in the period 2001-2015. 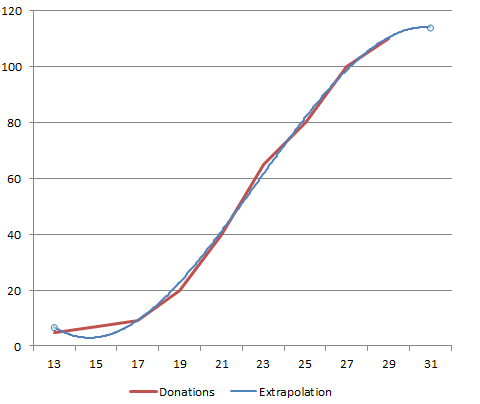 In Figure 2 we see a similar decline in generosity to religion (the red line) as to other organizations (the blue line). We also find that those who are still religious have become much more generous. Figure 3 shows that the amounts donated by Protestants (the green line) have almost doubled in the past 20 years. The amounts donated by Catholics (the red line) have also doubled, but are much lower. The non-religious have not increased their giving at all in the past 20 years. However, the increasing generosity of the religious has not been able to turn the tide. The second explanation is that prosocial values have declined. Because generosity depends on empathic concern and moral values such as the principle of care (Bekkers & Ottoni-Wilhelm, 2016), the loss of such prosocial values has reduced generosity. Prosocial values have lost support, and the loss of prosociality explains about 15% of the decline in generosity. The loss of prosocial values itself, however, is closely connected to the disappearance of religion. About two thirds of the decline in empathic concern and three quarters of the decline in altruistic values is explained by the reduction of religiosity. In addition, we see that prosocial values have also declined among the religious. Figure 4 shows that altruistic values have declined not only for the non-religious (blue), but also for Catholics (red) and Protestants (green). Figure 4: Altruistic values among the non-religious (blue), Catholics (red) and Protestants (green) (Source: Giving in the Netherlands Panel Survey, 2002-2014). Figure 5 shows a similar development for generalized social trust. Figure 5: Generalized social trust among the non-religious (blue), Catholics (red) and Protestants (green) (Source: Giving in the Netherlands Panel Survey, 2002-2016). Speaking of trust: as donations to charitable causes rely on a foundation of charitable confidence, it may be argued that the decline of charitable confidence is responsible for the decline in generosity (O’Neill, 2009). However, we find that the decline in generosity is not strongly related to the decline in charitable confidence, once changes in religiosity and prosocial values are taken into account. This finding indicates that the decline in charitable confidence is a sign of a broader process of declining prosociality. What do our findings imply? What do these findings mean for theories and research on philanthropy and for the practice of fundraising? First, our research clearly demonstrates the utility of including questions on prosocial values in surveys on philanthropy, as they have predictive power not only for generosity and changes therein over time, but also explain relations of religiosity with generosity. Second, our findings illustrate the need to develop distinctive theories on generosity. Predictors of levels of giving measured in euros can be quite different from predictors of generosity as a proportion of income. For the practice of fundraising, our research suggests that the strategies and propositions of charitable causes need modification. Traditionally, fundraising organizations have appealed to empathic concern for recipients and prosocial values such as duty. As these have become less prevalent, propositions appealing to social impact with modest returns on investment may prove more effective. Also fundraising campaigns in the past have been targeted primarily at loyal donors. This strategy has proven effective and religious donors have shown resilience in their increasing financial commitment to charitable causes. But this is not a feasible long term strategy as the size of this group is getting smaller. A new strategy is required to commit new generations of donors. Bekkers, R. (2012). Trust and Volunteering: Selection or Causation? Evidence from a Four Year Panel Study. Political Behavior, 32 (2): 225-247. Bekkers, R., Boonstoppel, E. & De Wit, A. (2017). Giving in the Netherlands Panel Survey – User Manual, Version 2.6. Center for Philanthropic Studies, VU Amsterdam. Bekkers, R. & Bowman, W. (2009). The Relationship Between Confidence in Charitable Organizations and Volunteering Revisited. Nonprofit and Voluntary Sector Quarterly, 38 (5): 884-897. Bekkers, R., De Wit, A. & Wiepking, P. (2017). Jubileumspecial: Twintig jaar Geven in Nederland. In: Bekkers, R. Schuyt, T.N.M., & Gouwenberg, B.M. (Eds.). Geven in Nederland 2017: Giften, Sponsoring, Legaten en Vrijwilligerswerk. Amsterdam: Lenthe Publishers. Bekkers, R. & Ottoni-Wilhelm, M. (2016). Principle of Care and Giving to Help People in Need. European Journal of Personality, 30(3): 240-257. Bekkers, R., Schuyt, T.N.M., & Gouwenberg, B.M. (Eds.). Geven in Nederland 2017: Giften, Sponsoring, Legaten en Vrijwilligerswerk. Amsterdam: Lenthe Publishers. De Wit, A. & Bekkers, R. (2017). Geven door huishoudens. In: Bekkers, R., Schuyt, T.N.M., & Gouwenberg, B.M. (Eds.). Geven in Nederland 2017: Giften, Sponsoring, Legaten en Vrijwilligerswerk. Amsterdam: Lenthe Publishers. O’Neill, M. (2009). Public Confidence in Charitable Nonprofits. Nonprofit and Voluntary Sector Quarterly, 38: 237–269. Wilhelm, M.O., Rooney, P.M. and Tempel, E.R. (2007). Changes in religious giving reflect changes in involvement: age and cohort effects in religious giving, secular giving, and attendance. Journal for the Scientific Study of Religion, 46 (2): 217–32. Van Leeuwen, M. (2012). Giving in early modern history: philanthropy in Amsterdam in the Golden Age. Continuity & Change, 27(2): 301-343. The recent success of the Ice Bucket Challenge for ALS across the world raises numerous questions on philanthropy. In this post I give some background information to answer five of these questions. 1. Where will it end? It is hard to predict how much money will be raised for ALS through the Ice Bucket Challenge. Some two weeks after the campaign really took off it has raised more than £100 million according to this UK source. The growth of donations to the ALS Association in the US now shows signs of decline, suggesting that the campaign is losing energy. 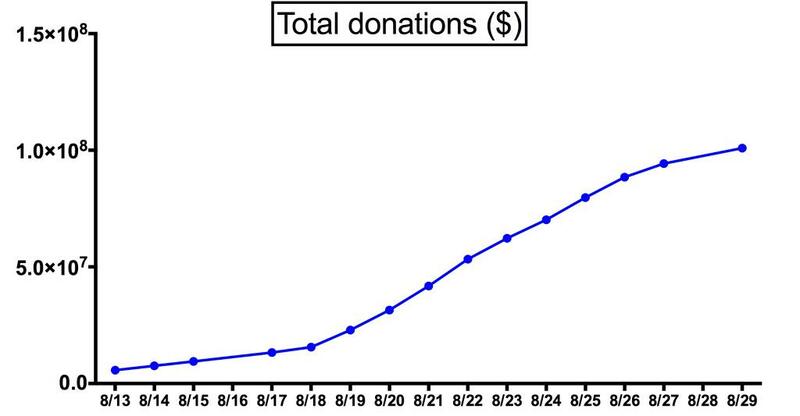 If the S-shape in the graph above continues, total donations to the ALS Association in the US could reach $120 million. 2. Will other charities lose from the challenge? It is often assumed that donors think about donations from a fixed annual budget: a dollar donated to the ALS Association cannot go to other charities. From this perspective, the Ice Bucket Challenge would come at the expense of other charities. However, it is also possible that the campaign does not affect other charities. There are many examples of campaigns that have not decreased amounts to other charities. In the Netherlands, the success of the Alpe d’Huzes bike rides against cancer has increased the amounts donated to the Dutch Cancer Society, while other health charities on average do not seem to have lost. Also for the Cancer Society itself the success of the bike ride has not come at the expense of regular fundraising campaigns, until questions were asked about the ‘no overhead costs’ policy promoted by the organizers of the event. Also there is the possibility that people will donate more to health charities (or charities in general) because they become more aware of the need for donations. When I was nominated for the challenge by my wife my response was to donate to the Rare Diseases Foundation (ZZF), a Dutch foundation supporting research on a variety of rare diseases. My best bet is that the Ice Bucket Challenge is a fortuitous fundraising event that does not come at the expense of donations to other charities. 3. Is the success of the Ice Bucket Challenge ‘fair’ given the relative rarity of ALS as a disease? Looking at all deaths in the course of a year, ALS is a relatively rare cause of death, as US data from the CDC show. Fi Douglas made a comparison with amounts donated, showing that donations do not seem to be directed towards the most lethal diseases. In a paper I published back in 2008, I compared donations to charities fighting groups of diseases and the number of deaths that these diseases cause. Giving in Netherlands to health charities seems more needs-based. It should be noted that the relatively high donations to charities fighting diseases of the nervous system is not due to the Netherlands ALS association, but mainly to other health charities. 4. What is the effectiveness of donations to the ALS Association? When people think about the effectiveness of donations, they often look for financial information about revenues and expenses. These numbers have limited value, but let’s look at them for what they are worth. According to its annual report, the Netherlands ALS association raised €6.5 million in 2013 and spent about €7 million on research, dipping into its endowment. The costs of fundraising approached €0.5 million, a relatively low proportion relative to the ALS Association in the US (ALSA). The ALSA annual report tells us the association spent $7 million on research in 2013, and $3.6 million on fundraising, having raised a total of $29 million. One could say fundraising in the US is less effective, more difficult, or simply more expensive than in the Netherlands. However, these numbers tell us nothing about the effectiveness of Ice Bucket Challenge donations. Their effectiveness depends completely on how the millions that are raised will be spent. From my limited knowledge on ALS it seems that the development of treatments or drugs against the disease is not on the verge of a breakthrough. Even though it would be premature to expect an effective ALS treatment any time soon, the sheer size of the amounts donated now will enable researchers to make some big steps. Now the stakes have been raised, donors may expect a well thought-through strategy of the ALS associations to spend the money in a responsible manner. The challenge for the ALS associations across the world is to manage donor expectations: to carefully communicate the uncertainty inherent in the development of medical innovations while avoiding disappointment and anger among donors expecting quick results. Moreover, some have questioned the utility of health research charities relative to other charities, saying that there are more effective ways to spend donations. In the Netherlands this opinion was expressed by my colleague from Rotterdam, Kellie Liket, in one of the major national newspapers, De Volkskrant. Some of the responses to this op-ed piece have identified the same substitution logic that we saw above; a logic that can be questioned. More importantly, the opinion depends on the assumptions made about what counts towards the ‘effect’ of a donation. 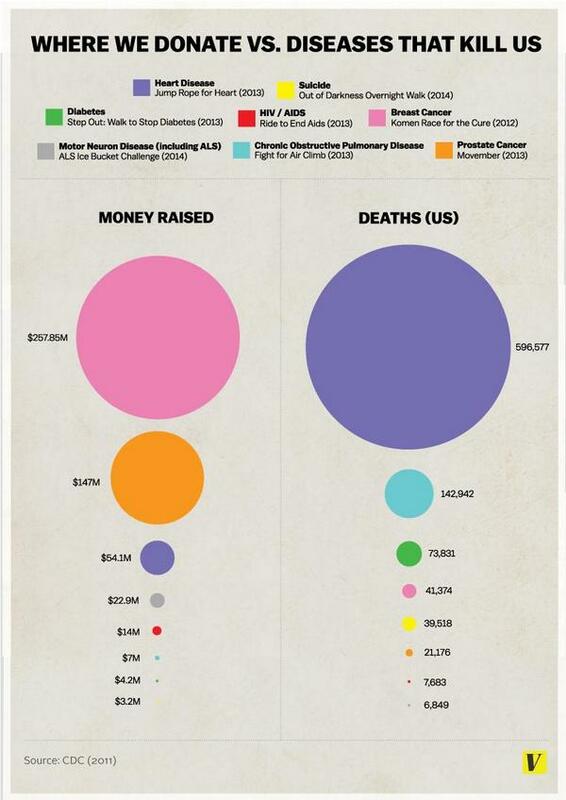 If we count lives saved per dollar contributed, medical research does not have a strong position in the debate. We can save many more lives by donating to improve health and living conditions in developing countries, where life is much less expensive to begin with. The same $100 buys more health in a poorer country, all else being equal. But this is not the health of people we know, or the health of loved ones who have suffered from a disease. It is our greater empathy for people close to us that makes us donate more readily to certain causes than others. 5. Why should we give to a certain cause or organization? Perhaps the most fundamental question raised by the Ice Bucket Challenge is a moral one. While research on philanthropy may show that we give out of compassion for people we know, there are many other reasons for people to give to charity. The joy of giving, aversion of guilt, being asked to give or seeing someone else give, the desire to obtain prestige, or simply an unexpected windfall or a ray of sunshine can motivate people to give. What we think of these circumstances and reasons is a different matter. The wisdom on the ethics of giving is much older than the 120 years of empirical research on philanthropy since Thorstein Veblen’s description of donations by the late 19th century New York elite as forms of conspicuous consumption. In the 12th century, Maimonides described eight levels of charity. Giving in response to a request is lower than anonymous giving; the highest form of giving would make recipients self-reliant and their dependence on charity disappear. Because of its largely public nature, the Ice Bucket Challenge can be placed on the lower rungs of Rambam’s Golden Ladder of Charity; but you can choose your favorite manner of donating in response to the challenge. And who knows: in the very long run, even your grudgingly accepted challenge and public donation may contribute to a cure for ALS – making victims of the disease less dependent on the charity of their loved ones. A new version of the User Manual for the Giving in the Netherlands Panel Survey is now available: version 2.2. The GINPS12 questionnaire is here (in Dutch).